Crowhurst is a small village situated between Hastings and Battle and has 25 listed buildings. The village post office also a convenience store closed in March 2008 and The Inn at Crowhurst closed in 1998 and then demolished and replaced by two houses in January 2000. The Plough Inn is the only remaining pub. The village also had a railway station built in 1902 and the branch line to Bexhill crossed nearby marshes on a 17-arch viaduct. The line was closed by Dr Beeching in 1964 and the viaduct was demolished in 1969. The church of St. George dates back to 771 and the yew tree in the church yard is said to be a thousand years old. The Manor House at the side of the church, now a ruin, was built in the 12th century by Walter de Scotney. Crowhurst is also home to Fore Wood Nature Reserve RSPB and because of its ghyll, with its steep ravines cut into the underlying sandstone, and site for breeding birds the ghyll was made a Site of Special Scientific Interest. Battle is an attractive market town with many shops, restaurants, cafes, galleries, a museum and five pubs; The 1066, The Abbey Hotel, The Bull Inn, Ye Olde Kings Head and The Senlac Inn and restaurant. Battle Abbey is situated at the end of High Street and the partially ruined abbey is a Grade 1 listed site. The Abbey and the Battlefield is run by English Heritage and is open to the public, entry is through the Visitors Centre. The town grew around the abbey and takes its name from the Battle of Hastings where William Duke of Normandy and the Saxon King Harold fought for the realm of England’s Kingdom on the 14th October 1066. 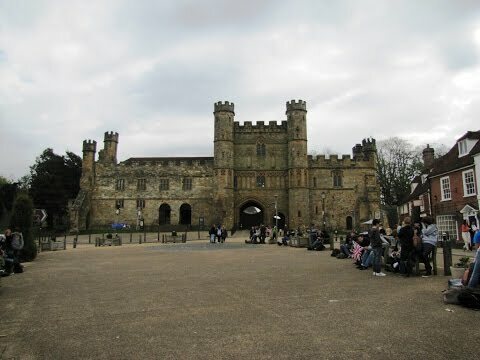 After the battle William became known as William the Conqueror and was ordered by the pope to build Battle Abbey as a penance for the lives lost in the battle. He built Battle Abbey on the ground where the battle took place and the high alter of its church was placed on the spot where King Harold died. This is now marked by a plaque on the ground and nearby is a monument to Harold erected by the people of Normandy in 1903. A re-enactment of the battle, organised by English Heritage, is held yearly on the battle ground and is a very popular tourist attraction. Battle Abbey is well worth a visit there is a visitors centre, a museum, an exhibition, audio tours, a marked walk round the battle ground, a cafe, toilets, a children’s playground and a picnic area. We park in Station Road opposite St. Georges Church. We take the footpath to the left of the church which leads past the ruins of the Manor, through a gate and into a field. We head forward through the field into the next field where we bear to left to pick up Powdermill Stream. We follow the stream on our left going over a footbridge and keep following the stream. On reaching some trees we cross over another bridge on our left so the stream is on our right. We head forward through the grasses and weeds for a short way and at the field in front of us we turn left and follow the hedge row and trees on our left. We go through a gap in the corner of the field and on our left is a pond we walk to the right of the pond and head slightly uphill and then follow the tree line on our left to the trees in front of us. At the trees in front of us we turn left into the wood then at the signpost we turn right with a pond on our left. At the end of the pond we turn right at a signpost and head uphill through a field to another wood. We walk through the gap in the trees and follow the footpath through the wood. At the edge of the wood we cross over a footbridge with a gate type stile then turn left, walk a short way, then turn right at the signpost and cross the field towards the buildings of Millers Farm. We then cross a footpath and head forward on the track to the right of Millers Farm. At Millers Farm we take the path on the right and keep to the fence line on the left, then at the signpost we turn left and then over a stile to the track and follow the concrete track to Powdermill Lane, the B2095. We cross straight over the road into Powdermill Wood. We follow the path through the woods until we come to Farthing Pond we cross a footbridge and turn left for a short way then we turn right and immediately take the path on the left going uphill. At the edge of the wood we go over a stile cross over the field then go through the gate opposite. We now turn right onto a track we are now on the 1066 Country Walk. We now follow the 1066 Country Walk through a couple of fields until we come to a signpost “Battle ½ mile”. We keep heading forward towards Battle for a short way until we see like an open iron gate stood on its own on the right, turn left here down to the fence and go over the stile. Follow the path downhill and go over the next stile into a field and turn right. At the end of the field take the path slightly to the right and follow it round to the left. We come to the High Street of Battle, turn right and head forwards to the Battle Abbey. We spend a few hours looking round Battle Abbey and the Battlefield. On leaving Battle Abbey we turn left down the path at the side of the Pilgrims Rest to the gate with a sign “George Meadows and Upper Stumblets”. We go through the gate and follow the track alongside the trees on the left until we come to a signpost, which we passed on our way into Battle, and turn left onto the 1066 Bexhill Walk. We keep heading forward until we come to a stile a small road and a stile opposite. Go over both stiles and the path follows the main road until we come to another stile we go over the stile, cross the main road and take Telham Lane opposite. We walk down Telham Lane and take the path on the right, still on the 1066 Walk, to Peppering Eye Farm and an Oast House. We carry on forward on the tarmac path, cross over a stream and the path starts to rise. When we come to Powdermill Cottage we turn left signposted 1066 Walk through the woods to a gate. We go through the gate and turn left to a footbridge we go over the bridge and follow the path through Fore Wood Nature Reserve RSPB. We pass a pond with a seat then turn right and head slightly uphill to a stile we go over the stile and across the field to cross over a little footbridge. We now follow the path to the road, turn right and follow the road back to the church where we started at Crowhurst. This is an easy to moderate walk with a few moderate inclines and declines. Approx 7.5 miles using OS map 124. Crowhurst is in the county of East Sussex. Crowhurst is situated on a back road off the A2100 between Battle and Hastings. There are public toilets at Battle that are also radar accessible in Market Square, Mount Street car park and also in the Battle Abbey. For refreshments there are five pubs, restaurants, takeaways, cafes and a supermarket. In Crowhurst there are no public toilets or shops but there is one pub, the Plough Inn.